Article 1: S.D. Correcaminos and The Municipal Sports Foundation (FDM) of Valencia City Council are organising the 39th Valencia-Trinidad Alfonso EDP Marathon on Sunday the 1st of December 2019. Article 2: The 39th Valencia-Trinidad Alfonso EDP Marathon, a 42,495-metre road race will be open to everyone, whether they belong to the Federation or not. The race is also open to foreign athletes who meet the RFEA and IAAF regulations, providing competitors are 18 years old or over on the day of the trial. The urban circuit is a tarmac one and is certified by AIMS/RFEA, and all of the kilometre markings are shown on display panels. The trial is featured in the RFEA and AIMS International Calendar and has been awarded the IAAF Gold Label. Article 3: The race will start at 8:30 A.M. and runners will be allocated Start Boxes in accordance with their forecast race times. The start of the Valencia-Trinidad Alfonso EDP Marathon is planned to feature four or more waves in order to maximise the convenience and safety of all runners. At 8:30 A.M., all runners with accredited times up to 3 hours 30:59 will start in accordance with the order set out on the entry forms. At 8:40 A.M., all runners with entry times between 3 hours 31:00 and 3 hours 45:59 will start. At 8:50 A.M., all runners with entry times between 3 hours 46:00 and 4 hours 00:59 will start. At 9:00 A.M., all runners with entry times of 4 hours 01:00 and over will start. The decision to have three waves of runners will not affect the proper timing of all athletes, no matter which wave they leave in. The Organisers reserve the right to establish additional waves as they deem fit for security, organisational, logistical or other reasons. Runners will be given sufficient notice of any such changes. The official maximum time for completion of the race is 5 hours 30:00. All runners who reach the Kilometre 25 mark after 12:30 P.M. on the 1st of December 2019 must hand in their race bibs, abandon the race and/or board the Sweeper Bus because their forecast time exceeds the limit for the trial set by the Organisers (the aforementioned 5 hours 30 minutes, discounting staggering in the four waves). All runners who enter the marathon with the aim of finishing the race in under 3 hours 31:00 must accredit their best time in a marathon, half-marathon, or 10-kilometre race in the last three years, doing so through the entry web site, or as the Organisers may subsequently request. The Organisers reserve the right to require accreditation from those runners who envisage completing the marathon in under 3 hours 46:00. For organisational and safety reasons and with the runner’s consent, the Organisers reserve the right to exceptionally change a runner’s box and/or to close box changes. Box changes will only be made when the box capacity so permits. When deciding which Start Box to assign you to, we check the information provided when you enter for the trial. Some of the details are automatically checked by looking up your results in earlier editions of our trials (Valencia Marathon, Valencia Half-Marathon, and 10-kilometre Valencia Trinidad Alfonso Race). In other cases, we ask you for further information through a URL or link to an accredited race in which you have chalked up a similar time (for instance, earlier classification in the 10-kilometre Race, the Half-Marathon, or the Marathon in the previous three years). 5.1 The change will be made providing the box capacity so permits. As a rule, we assign the box you request in your entry or in accordance with the time you accredited. If you need to change box after the initial registration accreditation process — whether because the time you submitted was wrong or does not reflect your best time — you can do so for a modest fee of €5 (levied for “Bib re-printing and management costs”. 5.2 If your time has improved since you entered for the trial, you can request a change of box free of charge. Note that you will need to provide a URL that accredits a faster time that you ran after making your entry. 5.3 If you have a time accredited for a faster box, you do not have to make any change given that you can start the race in a slower box, which you can access on the day of the trial. For example, if you are accredited for the PINK BOX, you can leave from the ORANGE BOX, the PURPLE BOX, or the WHITE BOX, as you wish, accessing any of these on the day of the race. 5.4 In general, from 2/11/2019 onwards, you can only make changes at The Runners’ Fair, whatever the reason may be. In this case, a fee of €15 will be levied for “Bib re-printing and management costs”. 6.1 Entries will be made through the following web site Tickets (Providing there running bibs are still available). From the 3rd of December 2018 to the 30th of June 2019= €50*. From the 1st of July to the 31st of October 2019 = €75*. (*) These prices do not include the Day License (€5 obligatory fee) for runners who do not have a valid Spanish (RFEA) license, a license of the Valencia Autonomous Region (FCVA) or the ‘Corredor Plus’ runners’ card. In any event, entries will be closed when the ceiling for runner numbers has been reached. This is to ensure sustainable growth in the size of the event and to ensure both quality and safety criteria are met. The organisers will notify runners when the last 1,000 race bibs are put on sale. The only details that the Organisers will take into account in the classifications in whatever category will be those provided by each runner on his or her entry form. To be eligible in the team category, in addition to each runner filling in his or her entry form, a team entry form must also be filled out — see HERE , listing the runners making up the team and the team’s club manager. The team form must be submitted before the 30th of October 2019. All handicapped runners falling within one of the 4 special categories will be given a 50% discount on the entry price, bearing in mind the dates and prices given above. To compete in one of the four special categories (wheelchair, functionally handicapped, sensorially handicapped, mentally handicapped), the entry must be made through FESA (Federación de Deportes Adaptados de la Comunidad Valenciana) [Valencia Federation for Special Sports Categories], whose contact e-mail is: direccion-tecnica@fesa.es, and whose telephone number is (+34) 963 465 726. FESA has the expertise, knowledge and experience to ensure handicapped sportsmen and sportswomen are placed in the right categories. Each blind or visually impaired athlete (B2) who so requires shall be entitled to be accompanied by a guide whose entry will be completely free. Such entry may only be made through FESA. Only one guide can be allocated to each blind or visually impaired athlete. The option of changing the runner’s name or bib/chip through our entry web site can be found in the section titled “Request change of runner”. Once the runner has requested the change of name, there is a period of 3 days to complete the new entry. Fee: €5, which will be paid by the new runner. The Organisers reserve the right to modify the method for making runner changes. For legal and sport reasons, especially those concerning security, runners are strictly forbidden to sell/lend/give their bibs to other runners unless they first obtain written permission to do so from the Organisers. Should the Organisers learn of such infractions before the race, they will cancel the race bib involved, rendering it invalid for the competition. Unknown persons taking part in the race both threaten safety and distort the classifications. Accordingly, the Organisers will note the details of anyone making their bibs available to others and ban them from entering trials in the following 4 years. The Organisers will also inform bodies holding other marathons, half-marathons, and 10-kilometre races of the irregularities committed. In the case of athletes who are members of the Royal Spanish Athletics Federation (RFEA) and the Valencian Athletics Federation (FACV), these bodies will also be informed of said infractions so that appropriate measures can be taken. The Organisers reserve the right to: (1) prevent the future entry of those athletes who are disqualified because they failed to fully complete the 42,195 metres of the course; (2) take legal action against those infringing the regulations set out in this document. A refund of the entry fee can be requested in the event of injury. Medical certification is required in such cases. The request can be made on our entry web site under the section “Request withdrawal due to injury”. The entry fee will be refunded in full in the event of injury or illness providing the runner submits a medical certificate with the corresponding diagnosis. The deadline for making an application for a refund and submitting the requisite medical certificate is the 1st of November 2019, after which no application will be accepted. The refund will be made through the same payment method used to make the entry (payment by debit/credit card or bank transfer) as soon as the medical documentation has been verified. Runners can take out a Comprehensive Refund Insurance Policy which guarantees an 80% refund of the entry fee and any contracted extras. In this case, no medical certificate is required to obtain a refund. 9.1 Our web site incorporates checks to avoid mistakes such as duplicate entries for a given race. In the event of duplicate entries, the earlier entry will be cancelled and a refund made. A fee of €5 will be applied to cover the costs entailed in managing duplicate entries. 9.2 The refund of an entry made with the ‘Regala’ (‘give a present’) product will be made electronically in a Running Card (+ info), which the runner can use in whole or in part for future entries and/or the services provided by future editions of the Valencia Half-Marathon, the Valencia Marathon and/or the 10-kilometre Valencia Trinidad Alfonso Race. Bibs and chips will only be handed out at THE RUNNERS’ FAIR, which will be sited at the Science Museum (Museo Príncipe Felipe) in Valencia’s City of Arts and Sciences. The Fair will run throughout the day from 8:00 A.M. to 9:00 P.M. on Friday the 29th and Saturday the 30th of November 2019. The Organisers reserve the right to change the venue for THE RUNNERS’ FAIR, in which case they will give prior notice. 10.1 If the runner cannot pick up these items in person. he/she must authorise someone else to do so by presenting the requisite documentation through the self-management section. Bibs will not be handed over to those who do not comply with these requirements. 10.2 To facilitate the pick-up of bibs not collected at The Runners’ Fair, the Organisers will give runners/authorised persons the option of picking up bibs (without runners’ bags) from a point next to the lockers on the Sunday on which the trial is held. This pick-up point will be open from 7:00 to 8:00 A.M. (Note that an original National Identity Document or Passport must be shown). All ages shown are those on the day of the trial. 1) Athletes in wheelchairs that are not fitted with drive-assistance through mechanisms or gears. Athletes are only allowed to push their wheelchairs with the aid of the wheel ring. Hand bikes are excluded from all competition categories given that these vehicles are solely valid for cycling events, not for athletic ones. There will be three trophies for each category and gender. 11.3 Athletes in wheelchairs, hand bikes or similar are strictly forbidden from overtaking the Local Police vehicle opening the way for the race. Those failing to observe this rule will be automatically disqualified from the trial. Any athlete disobeying this instruction shall do so at his/her own risk and shall not be covered by the insurance policies contracted by the Organisers. Article 12: Trophies will be awarded to the first three runners in the general classification and in all the categories. Grand Prize: Trophy for the winners in the Men’s and Women’s categories. General Classification: Trophies for the first three men/women. Classification Categories: Trophies for the first 3 men/women. Classification in the four handicapped athletes category : Trophies for the first 3 men/women. Autonomous University Championship Classification: Trophies for the first 3 men/women. Commemorative Medal for all trial finishers. All of the trophies that are not collected on the day of the trial will be held by the Organisers. Trophies that have not been collected from the club by the 18th of December 2019 will be disposed of. Article 13: There are the following cash prizes, which are open to all runners entered in the Valencia-Trinidad Alfonso EDP Marathon 2019. There is an additional prize of €20,000 for the male winner if he runs the race in under 2h04:30 and for the female winner if she runs the race in under 2h20:00. There is an additional prize of €30,000 for the male winner if he runs the race in under 2h04:00 and for the female winner if she runs the race in under 2h19:00. These last two prizes shall not be cumulative. They may however be aggregated with other prizes (for position, circuit record, and for setting a new world record. These prizes will be paid providing the times are under 2h20:00 for Men and under 2h45:00 for Women. Men who run the race in a time between 2h20:00 and 2h35:00, and Women with times between 2h45:00 and 2h55:00 will have their prizes cut by half. No prizes will be paid to male runners with a time of over 2h35:00 or to female runners with a time of over 2h55:00. The prizes in the General Classification, Spanish Classification, and the FACV Classification are cumulative. The prizes for the General Classification, for Spanish athletes, and for FACV license-holders are cumulative. Given that the Marathon is included in the RFEA’s National and International Calendar, there are compulsory anti-doping tests. All runners who have been selected for this test and who refuse to take it shall be automatically disqualified from all categories and shall not be eligible for any of the prizes. A formal complaint may be lodged with the RFEA concerning said refusal for the Association to act as it deems fit. Athletes who have passed the test and are eligible for a cash prize must wait for the official test results before they can receive the prize. All cash prizes will be subject to the retentions stipulated by the Law. The net amount will be paid by bank transfer or cheque once the RFEA times and doping test results have been officially released. * To be eligible for the cash prize of setting a new Spanish record, the athlete must be a Spanish national and hold an RFEA Federation license. NOTE: To be eligible for the cash prizes and trophies, the runner must be entered in the 39th Valencia-Trinidad Alfonso EDP Marathon. Article 14: The race will be supervised by the FACV Panel of Judges. There will be time controls throughout the race. Only runners wearing the chip on the back of their bibs will be listed in the classification. Runners will be required to run a short distance at the Runners’ Fair stand to check that the chip works properly. Article 15: The bibs/chips are unique to each runner and it is forbidden to sell/lend/give them to another runner. 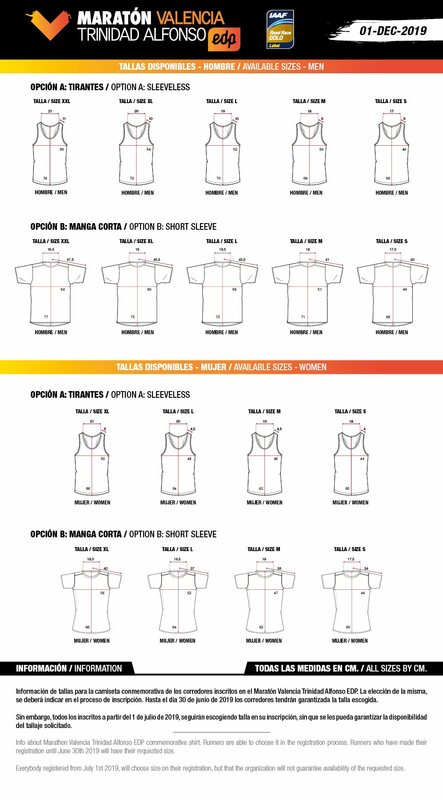 The bibs must be properly placed on the runner’s chest, without alteration or folding. Failure to observe these simple rules will lead to the runner being disqualified. Runners who are not entered for the race or who are not wearing the official bib and chip will be denied access. This measure is to uphold the rights of those runners who comply with the regulations. Unauthorised vehicles will be forbidden access to the circuit in the interests of runners’ safety. The Trial Judges and the Organisers reserve the right to disqualify any runner if they deem fit. Reasons for disqualification include: (1) not wearing one’s bib in a clearly visible manner; (2) altering the bib and/or lending/giving it to another person; (3) changing the details given to the Organisers and/or Arbitrating Judge concerning the runner’s National Identity Document/Passport and/or Federation status; (4) not running the whole race; (5) being in poor physical shape; (6) not providing the requisite documentation; (7) failure to meet any other FACV, RFEA, or IAAF norms and regulations. IAAF Federation members are required to compete in the running strips of their clubs and may be penalised if they fail to do so. Disqualified runners shall not be eligible for prizes and trophies. Article 15.2 Given the serious prejudice to both the race organisation and runners caused by those infringing the trial regulations or other rules, the Organisers reserve the right to take any measures permitted by Law that they deem fit. Accordingly, civil, penal, or administrative action may be taken against infractors. Infractions that may give rise to such action include: (i) not being entered for the trial and thus not possessing a running bib/chip for the race; (ii) competing with someone else’s running bib/chip (without having officially changed the name or hiding the name); (iii) competing with a running bib/chip other than that officially approved for the trial; (iv) competing with a fake running bib/chip (photocopied document or that imitates the bib). These are illustrative examples only and are not exhaustive. The Organisers may take legal action against infractors for other violations. Both infractors and those collaborating in facilitating violations shall be identified as ‘delinquent runners’. Those identified as ‘delinquent runners’ by the Organisers on the day of the race shall be detained, identified, and expelled by the trial security staff in the exercise of their powers. Those detained shall be identified, photographed, etc. with a view to taking legal action against them as may be deemed appropriate. Should the infraction become known after the trial, appropriate measures shall be taken by the Organisers when they become aware of the facts. ’Delinquent runners’ shall be notified of hearings to ascertain their liability and so that they can make their case. Article 16: The circuit will be marked with a line and there will be kilometre markings in accordance with IAAF regulations. Liquid refreshment points will be sited at roughly kilometres 5, 10, 15, 20, 25, 30, 35, 37.5, and 40, and there will be a point serving both liquid and solid refreshments at the Finish. Article 17: Medical services will be sited along the route and in the Start and Finish area. All runners must fill in the back of their bibs with their full names, telephone number for use in emergencies, whether they have medical problems (allergies, special conditions), are receiving medical treatment, and their blood group. Article 18: The only vehicles authorised to follow the trial will be those designated by the Organisers. The public are strictly forbidden to follow runners on motorbikes, bicycles, skates or any other wheeled vehicle. The Local Police and the Trial Judges will remove any unauthorised vehicle from the circuit in order to prevent accidents. Article 19: The Organisers decline any liability for damage, harm or injuries that trial participants may suffer or cause to Third Parties. Nevertheless, the Organisers are holders of an Accident and Third Party Insurance Policy to cover the risks inherent in a race of this nature. Article 20: Complaints must be orally made to the Arbitrating Judge no later than 30 minutes after the results have been officially announced. The Trial Judge’s decision is binding. “I take part in the trial of my own free will and I fully understand the difficulty of a race of this kind given both the distance run and technical considerations. I hereby state that I have sufficient technical knowledge and experience of the race and that I am physically and mentally fit to run in the trial. I hereby statethat I am in excellent health to take part in the 39th Valencia-Trinidad Alfonso EDP Marathon, and have good grounds for believing that my physical and mental state make me fit to run the race. I have passed all requisite medical examinations and that these have ruled out any disease, pathology, injury or other health problem that would make taking part in the trial risky. If my state of health changes, I solemnly undertake not to compete in the trial. During the competition, I shall do my utmost to help the Organisers prevent personal accidents. I also undertake to act properly and not to endanger my health or that of others. I accept the rules set out in the REGULATIONS FOR THE VALENCIA-TRINIDAD ALFONSO EDP MARATHON 2019, security protocols and other guidelines set by the Organisers. Furthermore, in the light of the foregoing I hereby exempt the Organisers, sponsors, and/or other participating institutions of any liability for any accident or injury which I may suffer before, during, or after the trial, renouncing any legal action against said parties. The purposes of gathering personal data Management of entries, results, race organisation, box management. Management of race sponsors and of the information they wish to convey to runners. Insurance policies for the trial, RFEA licenses, and so on. Dissemination of the Race both before and after the event. The data will be provided to the Royal Spanish Athletics Federation (RFEA) for executing The Runner’s Contract, and to MAPFRE as the insurance company, and to banks. Runners can receive information from the Sponsors through the Organisers. – know whether we process your personal data and to access/rectify/cancel/erase/oppose the data we hold on you and our processing of it. Notifications The Organisers use the following notification methods, all of which are equally valid: e-mail, mobile phone, any other mobile or web application (such as WhatsApp, Line, Telegram). Sponsors The Trial’s sponsors/collaborators may send you advertising materials through the Organisers, despatching this to the e-mail you give us. You many consult the names of our sponsors/collaborators on our web site. The Organisers shall not send your contact details to sponsors/collaborators unless you expressly authorise otherwise. The Organisers reserve the right to make changes to these Regulations as they deem fit. Any changes will be notified to runners through the Race Web Site and in the information given to athletes. Anything that is not covered by these Regulations shall be governed by the FACV, RFEA, and IAAF General Competition Rules in force.